Resources on various languages from the African continent, past and present. Languages of Africa - Detailed basic overview at Wikipedia. Roger Blench's publications on African (and other) linguistics - At his official site. Afroasiatic Languages overview - At Web Resources for African Languages.org (archived version). Nilo-Saharan Languages overview - At Web Resources for African Languages.org (archived version). Hausa is also currently (2016) available on Google Translate. The A type of Niger-Congo languages largely corresponds to certain groups of languages found mostly throughout the southern portions of West Africa and many places throughout central Africa. Niger-Congo Languages overview - At Web Resources for African Languages.org (archived version). Yoruba Dictionary.com - Work in progress project, by Pamela Smith Ph.D and Adebusola Onayemi FRCPC. Yoruba to English, English to Yoruba, Yoruba names and numerals. Igbo and Yoruba are also currently (2016) available on Google Translate. The B type of Niger-Congo languages mostly corresponds to the Bantu language family, found in huge parts of subsaharan Africa (especially central, southern eastern and southern Africa). Shina, Sotho, Svahili, Xhosa and Zulu are also currently (2016) available on Google Translate. 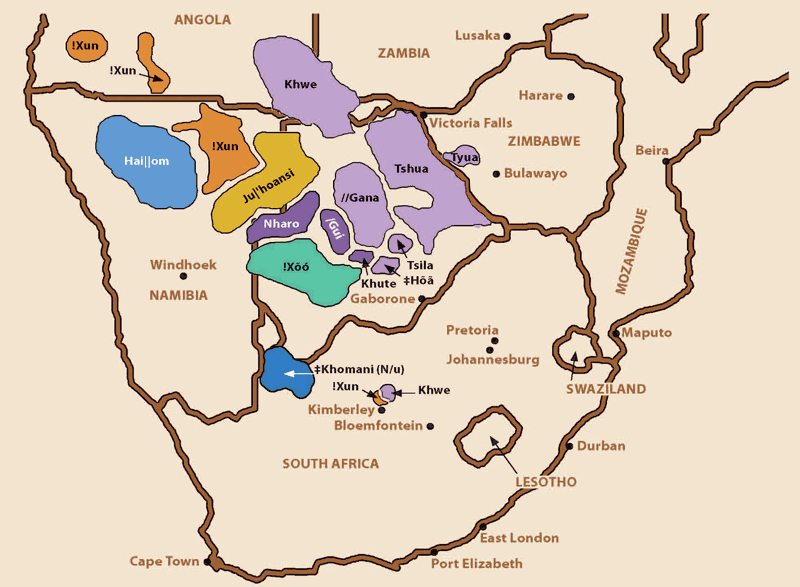 Khoisan languages are a group of archaic southern African languages, unrelated to the Niger-Congo language families and considered language isolates (similar to, e.g. Basque in Europe). Map showing distribution of San languages and pronunciation of "clicks" - Map courtesy of the Working Group of Indigenous Minorities in Southern Africa (WIMSA), archived version. Khoisan Languages overview - At Web Resources for African Languages.org (archived version). Sandawe (at Ethnologue.com) and Hadza (at Ethnologue.com) - The two small Khoisan group descended languages that exist in modern day Tanzania. Various other languages throughout Africa that haven't been satisfyingly classified yet, or have been confirmed to be isolates largely unrelated to surrounding languages. Remnant African Languages overview - At Web Resources for African Languages.org (archived version). Native languages that didn't originally develop on the African continent. Madagascar's Malagasy is the most prominent example, due to the Malagasy peoples' South East Asian origins. Malagasy is also currently (2016) available on Google Translate. African languages and dialects of European and Asian ancestry, African creoles and pidgins, modern African slang. "New" Languages of Africa overview - At Web Resources for African Languages.org (archived version). Afrikaans is also currently (2016) available on Google Translate.